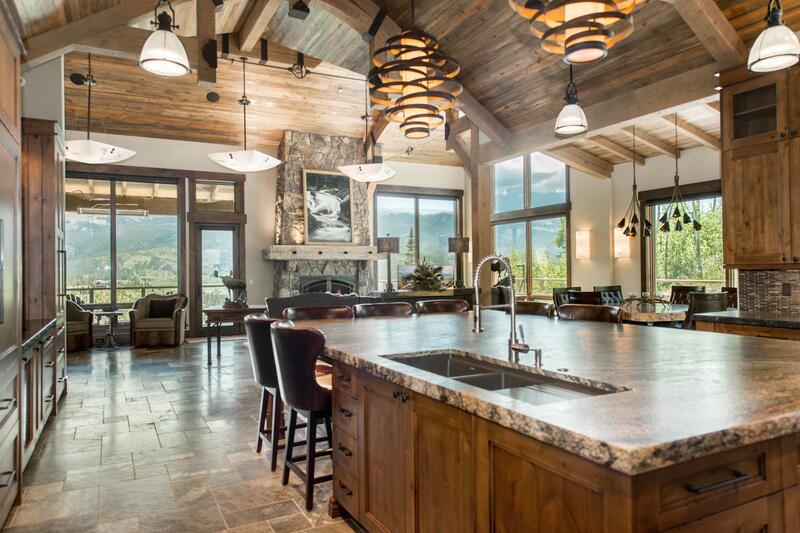 Experience the quintessential Rocky Mountain lifestyle from this exquisite custom home perched on 3.6-magnificent-acres in the exclusive Reserve at Elkhorn Ridge community. Ideally situated adjacent to Devil’s Thumb Ranch trail system, the home affords easy trail access featuring impressive mountain and meadow views. Within minutes of your doorstep you have unbelievable year-round recreation, including world-class snow skiing and boarding at nearby Winter Park Ski Resort, cross-county ski and snowshoe trails, gold medal fishing on the headwaters of the Fraser and Colorado Rivers, and miles of forested trails for hikers and mountain bikers to explore. Clad in hand-milled reclaimed solid white oak barn wood from Canada circa 1850, the home was expertly designed by Munn Architecture, and constructed with the highest quality and craftsmanship by Terra Firma Custom Homes. Perfectly nestled to capture jaw-dropping mountain vistas from every room, the home affords an idyllic alpine setting with a warm and welcoming floor plan that invites you to entertain with ease – complete with an effortless open layout, vaulted and beamed beetle-kill pine ceilings, and walls of windows streaming an abundance of natural light. Here you can make memories around the dinner table or play a round of pool in the expansive walk-out game room with wet bar. The sumptuous living and dining areas were made for relaxing by the fire, while the terraces provide an unobstructed vantage point for watching epic Colorado sunsets and wildlife meandering about. For the home chef, nothing compares to the generous gourmet kitchen, outfitted with gorgeous leathered slab granite countertops, an expansive island and breakfast bar, plus a detailed suite of built-in SubZero and Wolf appliances. Everything is top-of-the-line to make cooking and serving a breeze. A liquid coated metal range hood, sophisticated mosaic backsplash, and custom coffee bar add to the design – and since it’s open to the spacious living and dining areas, you’ll never be short on space when hosting a crowd. 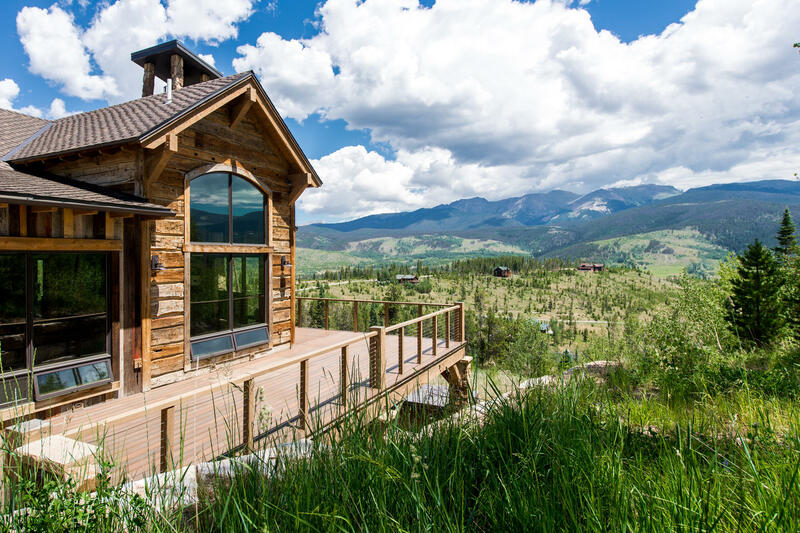 Swing open the door and take in the majestic mountain views from the terrace, overlooking the scenic Continental Divide or tuck inside to the floor-to-ceiling stone fireplace for picturesque mountain panoramas, creating the perfect backdrop to any occasion. After a long day out on the slopes, enjoy a soak in the hot tub beneath the stars or head to the luxurious master suite for the ultimate in privacy and relaxation. The master comes well-appointed with a floor-to-ceiling stone fireplace, sitting area with private terrace, and tranquil spa bath. An elegant freestanding tub framed by reclaimed wood of various hues, an oversized shower with multiple showerheads and shower seat, plus double vanities, and giant walk-in closet complete the experience. Guests will marvel at the stunning 6,075-square-foot interior, featuring a total of five bedrooms, all en-suite, and four-and-a-half-bathrooms. No detail was left unturned, including the custom lighting solutions by Image Complete, and incredible finish selections and interiors by Heather Pearce of ByDesign and Kim Linin of Green Butterfly. Even the dining room table received special treatment – crafted from an enormous cottonwood tree found in a riverbed in Utah, then dried, milled, and custom-finished specifically for this home. Beautiful ironwork railings, which can be found throughout the home, are fabricated from the retired Timberline Ski Lift cable. The entire property is wired with Crestron home automation controls for changing music, lights, security, and ambiance with the touch of a button, for a truly unique and elegant retreat. Outside, the fantastic deck offers versatile indoor-outdoor living space and houses one of the home’s four fireplaces for keeping warm during the winter months. Ideal for an active family looking to unplug and connect with nature, this private and secluded mountain retreat presents a rare opportunity to own a slice of Elkhorn Ridge paradise. 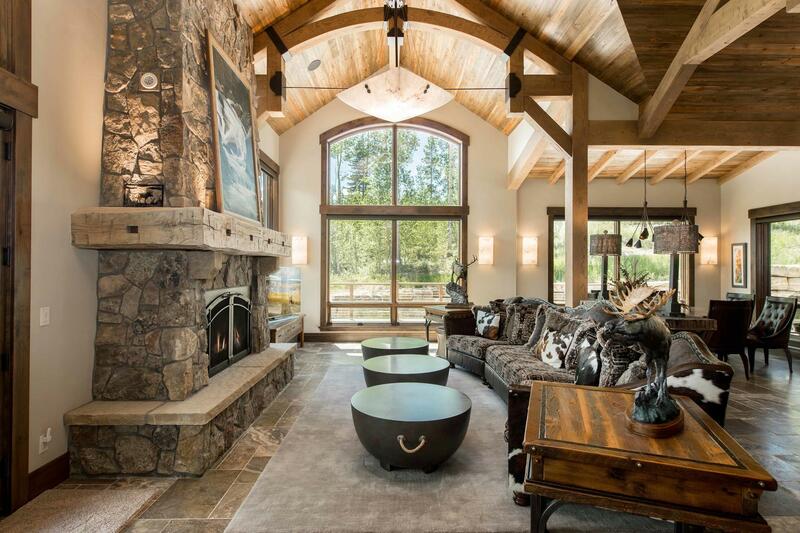 Few properties capture the essence of rustic luxury living quite like 181 Bull Bugle Bend. Call today to experience the lifestyle firsthand! Melinda Lee is a regular top producer at LIV Sotheby’s International Realty. She spent 13 years of her career assisting elite Denver clients, often times handling delicate transactions. Melinda, a Creighton University School of Business graduate, pairs marketing savvy and an outstanding work ethic with a strong business background. As a lifelong Colorado resident, she also excels at matching clients to the perfect resort property or second home. But perhaps the most surprising mountain match she made was her own. For Melinda, it was a change of both professional market and lifestyle. “That’s a big deal,” she says. “So I understand the logistics and the considerations for people who are making the leap.” With an insider’s understanding of neighborhoods, amenities, recreation, schools and health care providers, Melinda enjoys ensuring her clients are perfectly matched with the right home and lifestyle, whether they are looking for an investment property, second home, or full-time residence. Having thrived in a fast-paced urban market for years, Melinda brings a keen sense of follow through and a high level of communication with her clients. “The thing that sets me apart up here is bringing a different culture and mindset to transactions,” she explains. “Things can work a little differently in the mountains and I can bridge those gaps.” In fact, Melinda’s numerous contacts and resources in the Denver Metro area provide additional exposure for client properties. “I have a high standard for marketing,” she says, “and the exposure Sotheby’s can provide from a marketing point of view is exceptional.” With each property, Melinda ensures there’s proper staging and Sotheby’s trademark beautiful photography, as well as sophisticated digital marketing with a global reach. Melinda has excellent insight into both the Denver and Winter Park/Grand County market. “The Denver market is our buyer up here, and that market understands that Winter Park really is Colorado—very laid back and friendly.” She adds that the Denver market boom has also carried over into the second home market, and mountain communities like Winter Park are now low on inventory and things move very quickly. If she could share one professional insight right now, it’s this: “If there’s a property that comes on that catches your eye, you need to make the trip up, quickly, because properties are selling in days and even hours.” She’s even helped clients do deals virtually, using Facetime and Skype to help them see a hot property and closing the deal on their behalf. 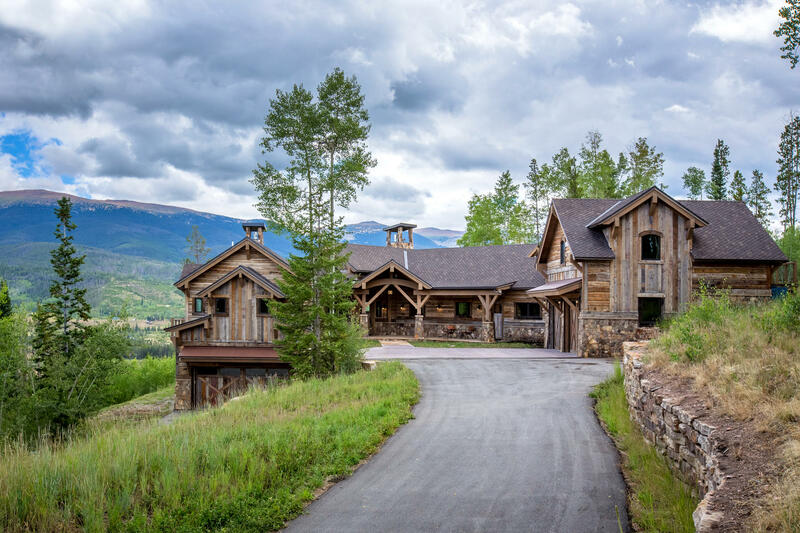 […] The post Q1 of 2019 Shows Impressive Results for the Summit County Luxury Real Estate Market appeared first on Colorado Real Estate Diary. […] The post Luxury Buyers Show Strong Confidence in the Vail Valley Real Estate Market appeared first on Colorado Real Estate Diary. […] The post Architecturally Stunning Mountain Contemporary Living, Starting at an Unbeatable $475,000 appeared first on Colorado Real Estate Diary.